E-Prime data files may be exported to a tab-delimited text file for import into an external package, or for re-import into E-DataAid via the Export command in the File menu or the Export tool button. The Export command displays the Export dialog box, which allows the export of all unhidden columns and rows in the spreadsheet to a text file. 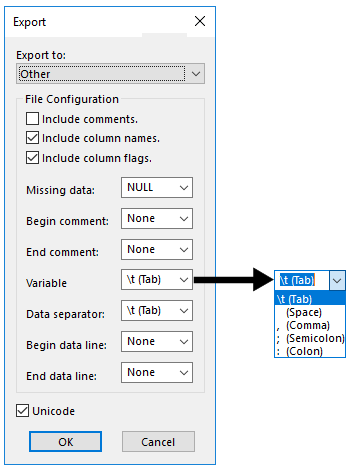 The dialog offers options to export to a format compatible with Excel, StatView, SPSS, or E-Prime text. The dialog also offers an “Other” option, which allows some flexibility in formatting the text file so that it can later be imported into other packages with minimal modifications. To export to Excel, choose the Excel option in the “Export to“ field. When exporting to Excel, the application automatically chooses the file configuration to export to a tab-delimited text file. 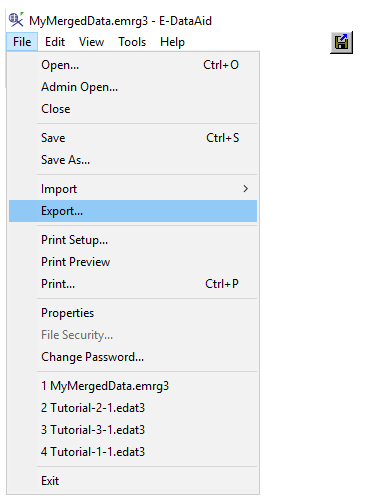 After the format for export is specified, the Export As dialog is displayed. In the Export As dialog, navigate to the path where the file is to be saved, and supply a name for the file in the “File Name” field. Once exported, the resulting text file can be imported into Excel using the Open command in the Excel File menu. To export to StatView or SPSS, choose the StatView and SPSS option in the “Export to” field. When exporting to StatView, the application automatically chooses the file configuration to export to a tab-delimited text file. After the format for export is specified (click OK in the Export dialog), the Export As dialog is displayed. In the Export As dialog, navigate to the path where the file is to be saved, and supply a name for the file in the "File name" field. Once exported, the resulting text file can be imported into Statview using the Open command in the StatView File menu. To export to a text file that may be re-imported into E-DataAid, choose the E-Prime Text option in the “Export to” field. When exporting to E-Prime text, the application automatically chooses the file configuration to export to a tab-delimited text file. After the format for export is specified (click OK in the Export dialog), the Export As dialog is displayed. In the Export As dialog, navigate to the path where the file is to be saved, and supply a name for the file in the File Name field. Once exported, the resulting text file can be re-imported into E-DataAid using the Import command in the E-DataAid File menu. NOTE: Only data visible in the spreadsheet will be exported. In order to export the raw data file as E-Prime text, redisplay all hidden rows and columns and remove active filters, or use the Restore Spreadsheet command. The Restore Spreadsheet command in the View menu clears all active filters, redisplays all hidden columns, and restores the columns to the default order. 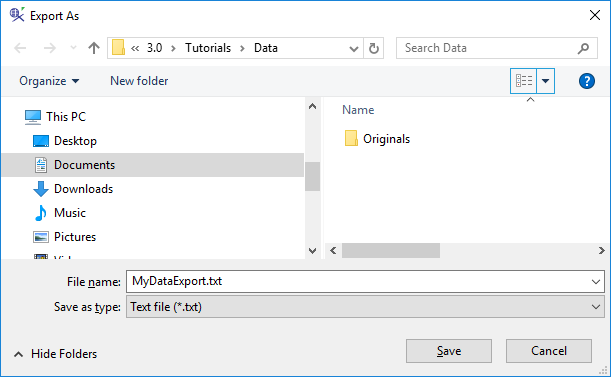 To export to a text file which may be imported into an external package other than StatView or Excel, choose the “Other” option in the “Export to” field. When exporting using the “Other” option, the application allows the user to designate the file configuration for the export. The user must designate how to export missing data, comments, and column headers. In addition, the configuration must indicate how the separators between variables and data are specified, as well as the information indicating the beginning and ends of individual lines of data. Common characters appropriate for each field are included in drop-down boxes for each field. The user may select from one of the options in the drop-down box, or may type another alternative directly in the field. After the format for export is specified (click OK in the Export dialog), the Export As dialog is displayed. In the Export As dialog, navigate to the path where the file is to be saved, and supply a name for the file in the File Name field. Once exported, the resulting text file can be imported into the intended external package.